International Trade is traded between two nation or countries. International Trade, the process by which nations Export and Import goods, services and financial capital. ” The benefit of International Trade a more efficient employment of the productive forces of the world.” – John Stuart Mills. Specialization permits larger outputs and can, therefore, offer the economics of large-scale production. it has the absolute cost disadvantage. ii) Comparative Cost Advantage (Ricardo): A country should produce and export those things in which it has the comparative cost advantage over competing countries. iii) Opportunity Cost Theory (Haberler): He advocated for measuring the value of output in terms of opportunity cost, instead of the labor theory of value as propounded in Absolute Advantage and Comparative Advantage Theories. iv) Factor Proportions Theory (Heckscher- Ohlin): A country will produce and export those things, which require abundantly available factors of the country. This means a labor-abundant country will procedure only labor-intensive goods and the capital abundant country will produce and export capital-intensive goods. The balance of trade of a nation is a systematic financial record, usually a year, of its imports and exports of visible commodities from and to the rest of the world. On the other hand, the balance of trade is the difference between the value of goods and services exported and imported. It contains the first two items of the balance of payments account on the credit and the debit side. This is known as “Balance of Payment” on “Current Account”. Kindlebergen has defined that “the balance of payments of a country is a systematic record of all economic transactions between the residents of the reporting country and the residents of Foreign Countries during a given period of time”. Transaction in goods, services, and income between an economy and the rest of the world. The balance of payments account of a country is constructed on the principle of double-entry book-keeping. Each transaction is entered on the credit and debit side of the balance sheet. But the balance of payments accounting differs from business accounting in on respect. In business accounting debits (-) are shown on the left side and credit (+) on the right side of the balance sheet. But in the balance of payments accounting the practice is to show credits on the left side and debits on the right side of the balance sheet. When a payment is received from a foreign country, it is an accredited transaction while payment to a foreign country is a debit transaction. The principal items shown on the credit side are exports of goods and services, unrequired (or transfer) receipts in the form of gifts, etc. from foreigners, borrowings from abroad, investments by foreigners in the country, and official sale of reserve assets including gold to foreign countries and international agencies. The principal items on the debit side include imports of goods and services, transfer payments to foreigners, lending to foreign countries, investments by residents to foreign countries, and official purchase of reserve assets or gold from foreign countries and international agencies. These credit and debit items are shown vertically in the balance of payments account of a country according to the principle of double entry book-keeping. Horizontally, they are divided into three categories: the current account, the capital account, and the official settlements account or the official reserve assets account. The current account of a country consists of all transactions relating to trade in goods and services and unilateral (or unrequited) transfers. Service transactions include travel and transportation, income and payments on foreign investments, etc. Transfer payments related to gifts, foreign aid, pensions, private remittances, charitable donations etc. received from foreign individuals and governments to foreigners. The capital account of a country consists of its transactions in financial assets in the form of short-term and long-term lending and borrowings, and private and official investments. In other words, the capital account shows the international flow of loans and investments and represents a charge in the countries foreign assets and liabilities. Long-term capital transactions related to international capital movements with the maturity of one year or more and include direct investments like a building of a foreign plant, portfolio investment like the purchase of foreign bonds and stocks, and international loans. On the other hand, short-term international capital transactions are for a period ranging between three months and less than one year. The Official settlements account or official reserve assets account is, in fact, a part of the capital account. But in the UK and USA balance of payments accounts show it as a separate account. The official settlements account measures the charge in nation’s liquid and non-liquid liabilities to foreign official holders and the change in a nation’s official reserve assets during the year.’ The official reserve assets of a country include its gold stock, holdings of its convertible foreign currencies and SDKs, and its net position in the IME. There are two types of transactions in the capital account, private and government. Private transactions include all types of investments: direct, portfolio and short-term. Government investments consist of loans to and from foreign official agencies. In the capital account, borrowings from foreign countries and direct investments by foreign countries represent capital inflows or credits because these are receipts from foreigners. On the other hand, lending to foreign countries and direct investments in foreign countries represent capital outflows or debits because they are payments to foreigners. The official settlements account shows transactions in countries A’s official reserve assets (net). 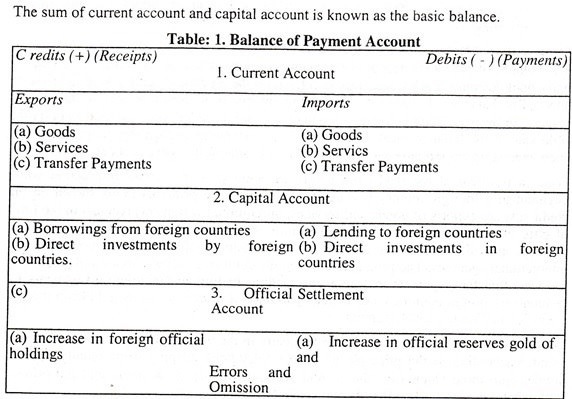 Errors and omissions is a balancing item so that total credits and debits of the three accounts must equal in accordance with the principles of double-entry book-keeping so that the balances of payments of a country always balance is the accounting sense. 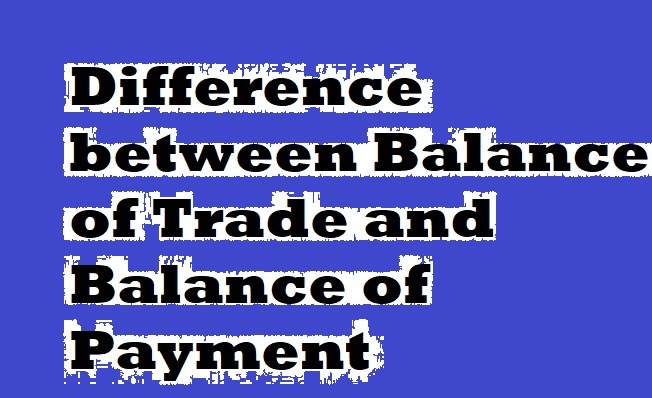 “To say that the balance of payments always balances is to say that a net credit balance in one of these accounts must have a counterpart net debit balance in one of the other accounts or in a combination of the two other accounts. The algebraic sum of the net credit and debit balances of the three accounts must equal zero”.